The Bellini House is a Boutique B & B born in 2014, with 6 rooms with private bathrooms, located in the historic center of Naples, in the central and vibrant Piazza Bellini, beating heart of Naples at night. The particularity of the structure is the lush and hidden garden overlooked by 3 rooms as well as part of the breakfast area, which makes the B&B, located in one of the most pulsing squares of Naples, a quiet place of peace and relaxation. The Bellini House – the name stems from the idea that we wanted a place where we could invite our friends and guests – something more than a standard B&B. We imagined a home away from home that everyone could consider “theirs”. A house designed to receive guests, entertain them, intrigue them and most of all, allow them to relax and get to know the city of Naples. Each room has its own defined identity with a short story to tell. Breakfast is served with the intent of spoiling our guests with organic products (try our homemade jam and fruit) and our “speciality coffee” in the lounge or directly on the counter of the 19th century kitchen-bar, if you like to share it with other guests, or in the spacious hall on the design armchairs surrounded by “unique” industrial style tables. In the springtime, it’ll feel like being in Provence, when you enjoy your cappuccino and cornetto overlooking lush, green gardens from the private balcony of your room. The perfect way to transform your stay in Naples into a moment of pure bliss and artistic meditation. Within The Bellini House, you can make yourself feel at home, as you skim through your favorite magazine in the living room, abandon yourself to conversation with other guests at the bar, relax and read a book on the many couches and lounge chairs, or sink back in a cozy chair on the balcony, watching the sunset over a glass of fine wine from our cellar. We also asked young emerging artists to create a real narrative, a special dialogue between them and our home, to give life to a unique expressive message. 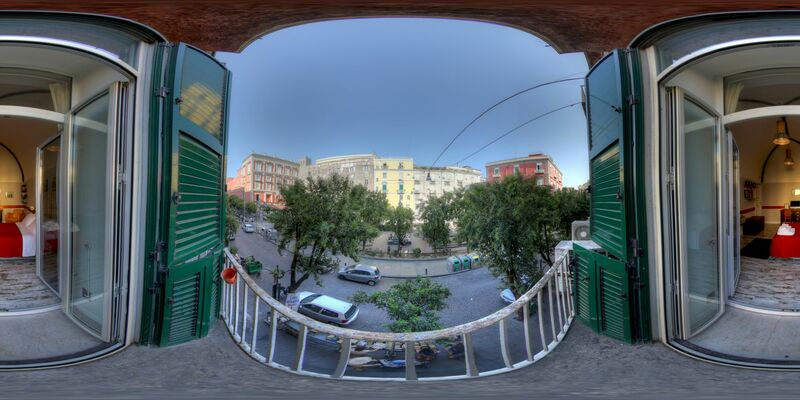 And to contaminate the spaces of “Bellini House” including the rooms, to try a new model of artistic fruition in Naples. Inside there are objects found, recovered, inherited, re-invented, reused and transformed, objects that have a soul and that blend with harmony and simplicity to pieces of design and works of art. You can observe them, use them, read them, and sometimes buy them. A new concept of relationship, meeting and “hospitality” (in the sense of being a guest) with space and the environment, both within the visions of the artist and in relation to the house and the people who will animate it. Breakfast is served at the Bellini House from 8:00 to 11:00. There will always be our staff to help you. We appreciate receiving information on any preferences, such as gluten-free breakfasts and special times. With the pulp of fresh orange juice that we squeeze every morning, we prepare a delicious jam recovering the whole orange and not consuming unnecessarily the fruit. Standard set: 1 double bed + single bed. Check-in time is from 8:00 to 20:00 only by appointment. We accept arrivals after 20.00 but only if previously agreed and in any case, we will apply a surcharge of 20.00 € unless you make use of our pick up service. The room will be ready from 16:00 or earlier if possible. However, you can leave your luggage in the facility, go out or relax in our “lounge area”. Therefore, we kindly ask all our guests to inform us of their estimated time of arrival. Late check-in: We apply a surcharge of 20.00€ for arrivals after 20:00. We cannot accept reservations for guests arriving by car after 20.00. Please contact us by phone in this case. The easiest way to get to the structure is with our private driver who will wait for you at the airport, port or train station and take you directly to the B & B. Our rates are: €25 max. 2 passengers, +€5 for each passenger over the second, FREE for all guests who book directly with us (minimum two nights with standard rate, not discounted). If you have already booked with an agency or through a portal of mediation, send us a new email. Our B&B is located in Via Santa Maria di Costantinopoli, 94 on the first floor. By taxi, ask your cabbie to take you to Piazza Bellini. We are located directly in front of the statue. Take METRO LINE 1 and get off at DANTE. Walk up Port’Alba and take a left towards Piazza Bellini. Remember that our B & B is located in the heart of the historic center of Naples and therefore moving by car is not at all easy. Take care not to pass any of the ZTL gates (“VARCO ATTIVO” = (MEANS) DO NOT ENTER = BILL) placed around the entrances of the historic center (Piazza Dante, Via Mezzocannone, Via del Sole), otherwise you will incur a bill. Our partner garage (private parking area inside the garage for Bellini and Dante House guests, no reservation needed) is located in an area that is difficult to access for tourists, within the alleyways of Piazza Dante. Therefore, for those wishing to park in the vicinity of our structure (about 7 minutes walk), we offer a free pick up service with the scooter to the garage, with transport next (on foot) to the structure. This way you will avoid any parking problems. The pickup service must be booked in advance and therefore we will not be able to satisfy last minute requests. We also need to know what kind of car you have rented. After the request, and according to your itinerary by car, an easy meeting point will be indicated with our scooter driver. The parking space is the GARAGE CORRERA, located in Via Francesco Saverio Correra, 29. The price is € 35.00 one day, 25 euros from the second (check out at 12.00 the following day, a surcharge of € 2 for each subsequent hour). It is necessary to leave the keys to the responsible person on duty. The parking balance must be paid directly to us, at check out, in cash. We disclaim any responsibility for issues related to the choice of a garage not affiliated with us or in case you go to the garage without using our free accompanying service. Please also remember to communicate by text or phone call to +39 392 645 2966 your arriving time at The Bellini House, because our reception is only by appointment.